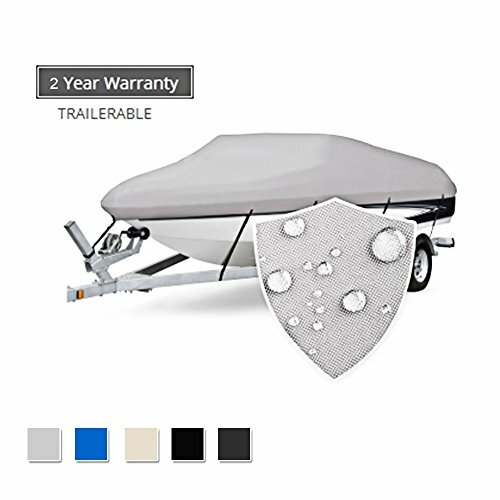 MAXSHADE COVERS Standard Bimini Top protects you and your boat from the sun and rain while adding one to your boat. It's made of 1" Anti-rust and sstrong aluminum frames,Marine-grade 600D polyester canvas with double PU coating and nylon/stainless steel fittings. The standard bimini top is partially assembled and is easily installed by one or two people in few minutes. 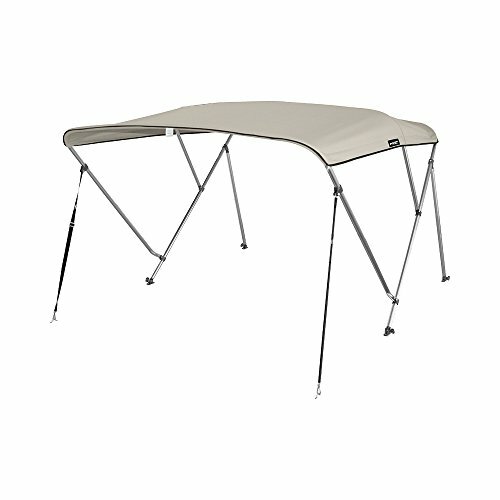 Specification MAXSHADE COVERS 3 Bow Bimini Tops include 6 different sizes: A. 3 Bow 6'Length x 46"Height x 54"-60"Width B. 3 Bow 6'Length x 46"Height x 61"-66"Width C. 3 Bow 6'Length x 46"Height x 67"-72"Width D. 3 Bow 6'Length x 46"Height x 73"-78"Width E. 3 Bow 6'Length x 46"Height x 79"-84"Width F. 3 Bow 6'Length x 46"Height x 85"-90"Width Color Available : Grey, Pacific Blue, Burgundy,Navy,Beige,Forest Green MSC Standard 3 Bow Bimini Top Contains: 1 x Marine Grade 600D Polyester Canvas canopy 1 x Anti-rust and strong aluminum frame 1 x Color Coordinated 600D Polyester Canvas made storage boot 2 x Rear Support Pole 2 x Front Adjustable Strap 1 x Assembly Instruction Manual for easy install 1 x MSC Bimini Top Fittings Box Note: MAXSHADE COVERS Standard 3 Bow Bimini Tops are NOT designed for Rigid Inflatable Boat to use. The Oceansouth 3 Bow Standard Bimini Top is designed and assembled in the USA, constructed with quality materials, and tested to make sure you have 100% guaranteed satisfaction. 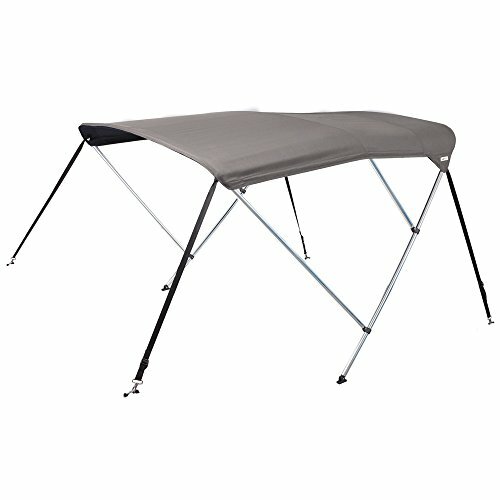 It features the Oceansouth unique Integrated Storage Sock (Patent Pending ) system the easy way store your bimini top. 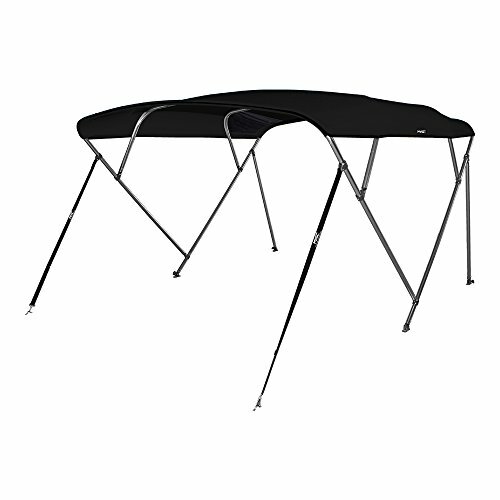 The heavy duty 1" framework and 600 Denier Mildew & water resistant Polyester canvas with High UV protection and Fade resistant qualities makes it the smart choice of bimini for your boat. 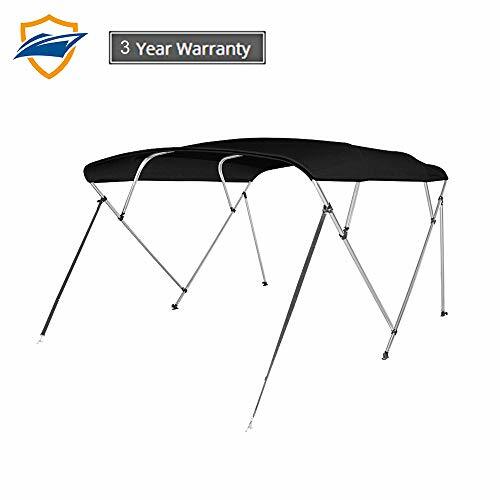 MAXSHADE COVERS Standard Bimini Top protects you and your boat from the sun and rain while adding one to your boat. It's made of 1" Anti-rust and strong aluminum frames,Marine-grade 600D polyester canvas with double PU coating and nylon/stainless steel fittings. The standard bimini top is partially assembled and is easily installed by one or two people in few minutes. 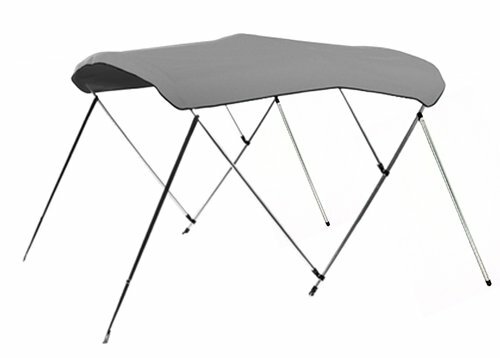 Specification MAXSHADE COVERS 4 Bow Bimini Tops include 4 different sizes: A. 4 Bow 8'Length x 54"Height x 73"-78"Width B. 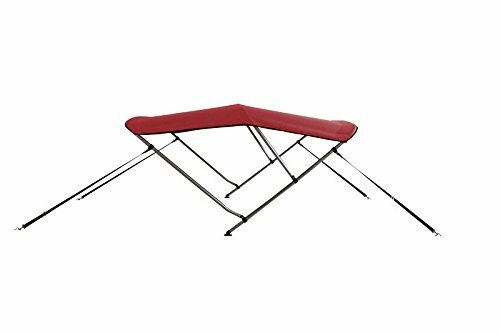 4 Bow 8'Length x 54"Height x 79"-84"Width C. 4 Bow 8'Length x 54"Height x 85"-90"Width D. 4 Bow 8'Length x 54"Height x 91"-96"Width Color Available : Grey, Burgundy，Navy，Beige MSC Standard 4 Bow Bimini Top Contains: 1 x New Design Marine Grade 600D Polyester Canvas canopy 1 x Anti-rust and strong aluminum frame 1 x Color Coordinated 600D Polyester Canvas made storage boot 2 x Rear Support Pole 2 x Front Adjustable Strap 1 x Assembly Instruction Manual for easy install 1 x MSC Bimini Top Fittings Box Note: MAXSHADE COVERS Standard 4 Bow Bimini Tops are NOT designed for Rigid Inflatable Boat to use. MAXSHADE COVERS Canopy canvas for 3 Bow 4Bow Bimini TopMade of 600D polyester canvas with double PU Coating,Marine grade Perfect for MSC standard 3 Bow Bimini Top,Fits most 3Bow 4Bow Bimini tops of the marketStorage Boot sewn in Canopy CanvasColor Available: Gray and Pacific BlueNote: this item is a canopy canvas for bimini top replacement. Bimini top frames,hardwares and straps are not included. About Products1. Made of 600D Polyester Canvas2. Made from 1'' diameter bright anodized aluminum frame with double-walled main bow legs for maximum strength 3. Included black nylon fittings and hardware4. Stainless steel saddle, stainless steel hook, stainless steel adjuster, fixing tool, thumb screw, deck mount included5. 4 adjustable straps for the front and the rear 6. Double overlapped stitching7. Color cordinated storage bag included 8. Available in six different sizes9. Using instruction is included10. Three years warrantyTips: How to measure your boat for a bimini top1. Using a tape measure,decide which length top provides the desired amount of shade coverage.2. The pivotal mounting point will be approximately at the center point of the top on each side of your boat. 3. After this, measure the distance beteewn these mounting points to determine the width you need.4.While standing inside the boat, measure from the pivotal mounting point straight up to determine the desired height. 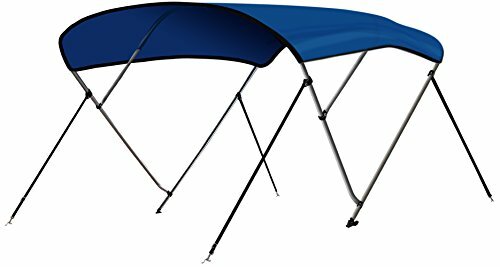 Seamander Bimini Top Boat Cover Top is made of 8.5 oz. 600D marine-grade polyester with double PU back coating fabric and 1" Dia. Anodizing Aluminum Frame. This item contains all hardware including: S.S. Saddles, S.S. screws, S.S. Hooks, Nylon Deck Mounts, Jaw slides etc. 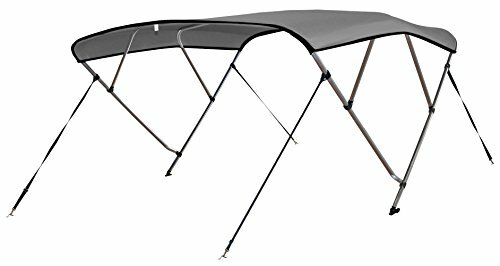 Seamander Bimini Top Boat Cover Top is support pole type of Bimini Top with storage boot. 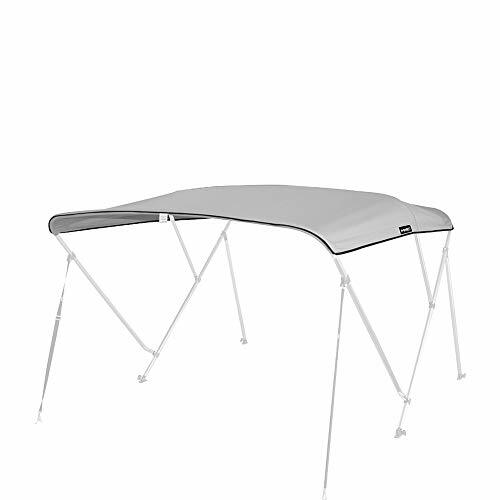 Packing List: Bimini Top Canopy x 1PCS Bimini Top Storage Boot x 1PCS Bimini Top Frame x 1 SET Bimini Top Hardware Box x 1PCS Installation Paper x 1PCS Bimini Top Hardware Box contains: Thumb Screws x 4PCS Nylon Deck Mount x 2PCS Nylon Straps with S.S. Hook x 2Sets S.S. Saddle x 4PCS Self-steel screw x 12PCS S.S. Bolt x 6PCS S.S. Hexagonal Nut x 8PCS Note: This item is partially assembled and packaged. one or two people can well accomplish the job in few minutes.